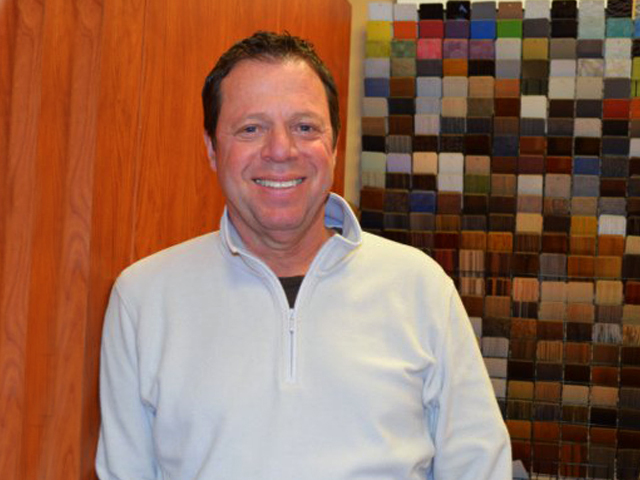 Sterling Architectural Millwork (formerly Sterling Custom Cabinets) is a leading manufacturer of dental/medical cabinetry and architectural millwork based in Springfield, Massachusetts, that has served the greater New England region since 1994. 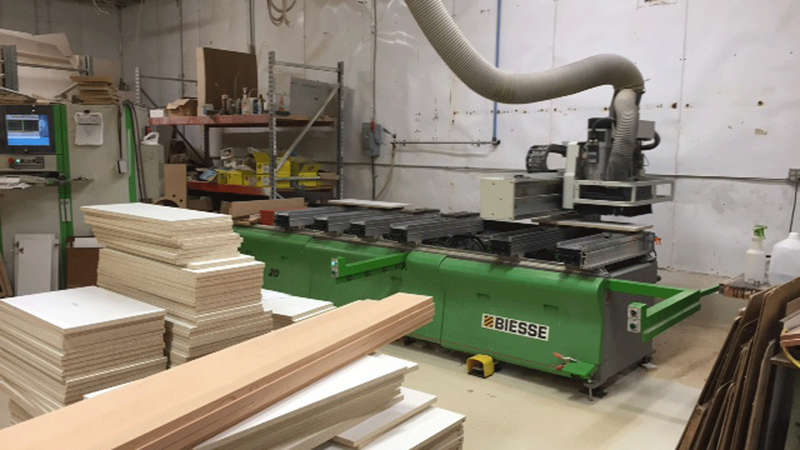 The company’s 40,000-square-foot facility is filled with an extensive range of Biesse Group machinery as part of a successful partnership that began in 2001. That year, Sterling purchased a Rover 20 that helped shape the company’s future. “We were so antiquated,” said Sterling Production Manager Mike Stiso. “Layout for hardware was done by hand and there was no automation whatsoever. That machine improved things tenfold. 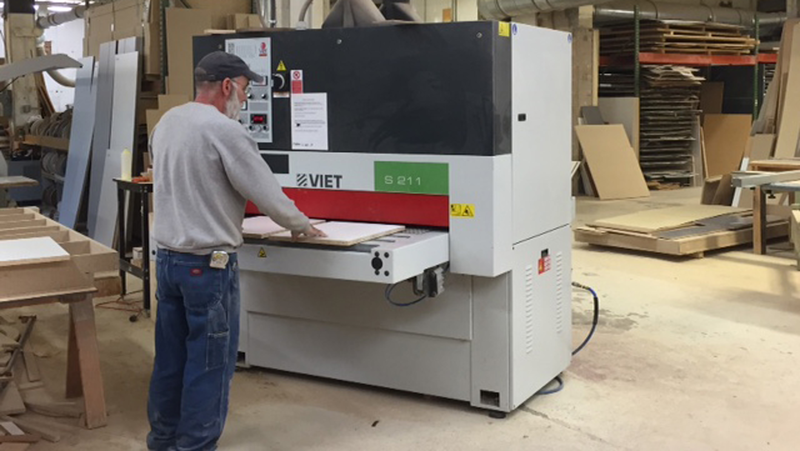 It was amazing.” In the years since, Sterling has gone on to purchase a bevy of Biesse Group machines and its current lineup includes Biesse’s Akron 1440 edgebander with Air Force System, a Viet S211 sander and Selco EB 120 panel saw along with Intermac’s Master 43 CNC and a Bridge Saw for stone production. 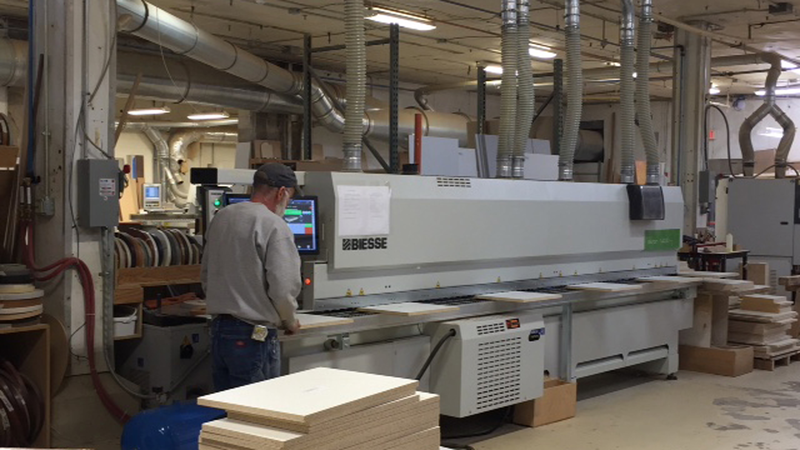 Sterling, a 3 mm edgebanding shop, has made the progression from an Akron 800 to Akron 1440 with Air Force System. 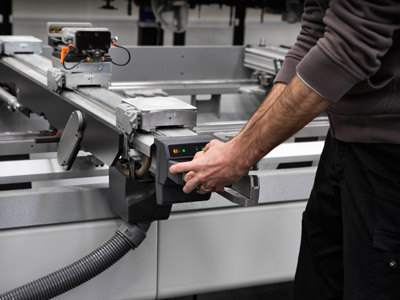 The company was sold on the AFS-equipped machine’s ability to deliver zero glue line. This is a major consideration for the company’s many customers in the dental and medical sectors because of bacteria concerns. 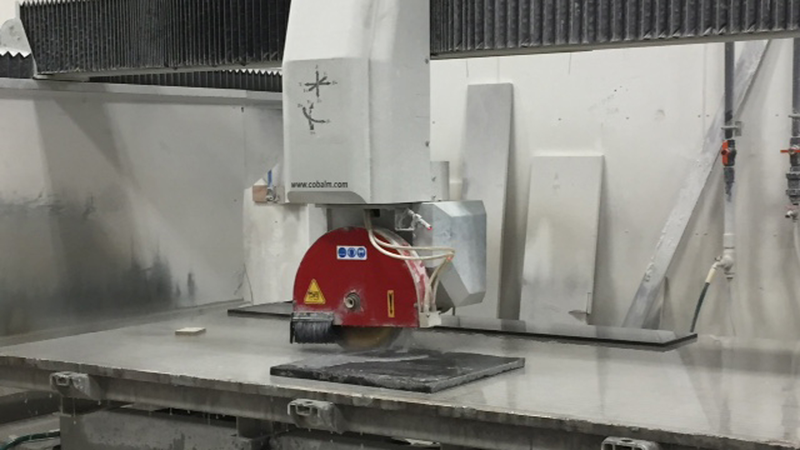 Not only has the Akron 1440 with AFS elevated Sterling’s manufacturing in a major way – the company churns out approximately 600 individual cabinet and countertop components each week – it has also improved the efficiency of the process. “It has definitely increased our production on the edgebanding side,” he said. “I have multiple operators that can now use that machine because it’s a lot easier for them to operate and for me to maintain and adjust. 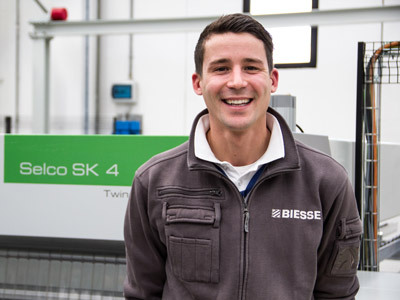 It’s just a superior machine.” After nearly two decades of working with Biesse Group, Stiso has also come to appreciate what he describes as the highest level of customer service in the industry. More runtime means more productivity and profitability at the end of the day. He added, “The service people and technicians at Biesse are very patient. They know they’re dealing with wood workers and not electrical engineers". "They have taught me over the years how to work through the electrical schematics, troubleshoot a circuit and find the problem and they’re always checking back with you. You can’t put a value on that and I’ve never seen a company touch it yet. Nobody can hold a candle to Biesse’s service level.” In 2016, Sterling enlisted Intermac to help the company overcome a major challenge in its production process. After the industry saw a dramatic shift in the use of engineered stone, Sterling was forced to rely on local subcontractors for that aspect of production. “We were having difficulty achieving quality and delivering on a timely basis while using the available subcontractors in our area,” Stiso said. “Plus, we do a tremendous amount of radius work for reception areas, a lot of curved shapes and surfaces, and there was no one in our area that was automated. All of that work that we were looking to get done, it was getting done old school, and it takes a lot longer.” Stiso joined company owner Fotis Gazis and ventured to Charlotte for the 2016 grand opening of Biesse Group’s new 23,000-square-foot Showroom to do some investigation into Intermac’s solutions for stone processing. They ended up leaving with a Master 43 CNC and Bridge Saw (along with the Akron 1440 with Air Force System and Viet S211 sander). Intermac allowed Sterling to take complete control of its stone project work and the rise in quality and productivity was palpable. “We had never bought machinery like that, with that much all at one time,” Stiso said. 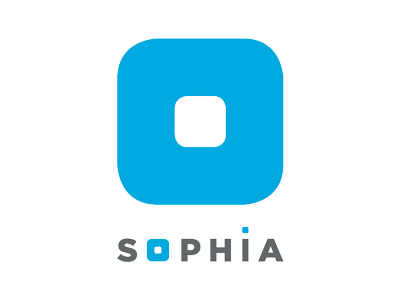 “The Master brought us the capability of maintaining projects and getting them out on time and doing a far superior product for clients. There’s always a change along the way with a project, and when you were dealing with a subcontractor and having to re-do or modify something at that point, it’s night and day when you’re automated and have that capability.” Stiso has to laugh when he thinks about the machine that launched Sterling’s business relationship with Biesse 17 years ago. In a good way, of course, as that piece of equipment remains a prime performer on his shop’s floor. “The Rover 20 is still running like a tank,” he said. “It’s funny when I call and the technicians always kid with me and say, ‘It’s time for a new machine.’” There have been several for Sterling since that humble beginning, but it’s a testament to Biesse Group’s quality that Sterling’s maiden machine is still so powerful in production. For more information, email marketing@biesseamerica.com or call 704.357.3131.